Courier company Deadline has this week unveiled a new zero emissions fleet of vehicles. 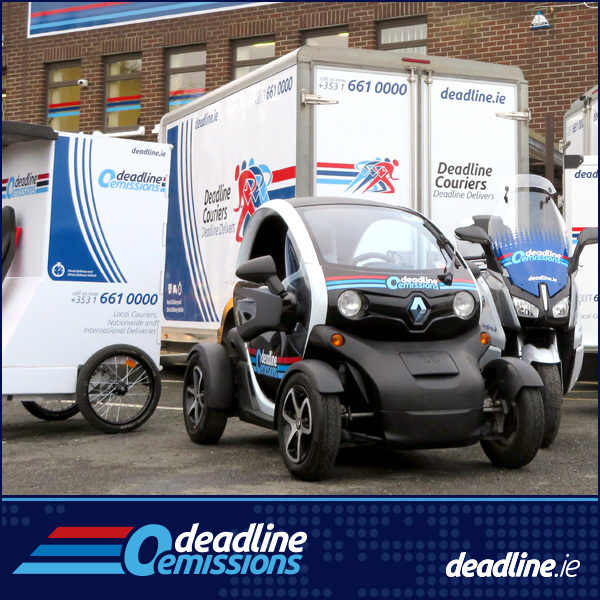 Two specially adapted bicycles, two electric motorbikes, a Twizzy and an electric BMW motorbike will all take to the streets of Dublin this week to carry out deliveries. Deadline offers a comprehensive, secure and confidential courier, transport and parcel delivery service in Dublin, Ireland Nationwide and Worldwide International. Door to door, next day, urgent and direct services, scheduled services and a number of online and mobile app booking solutions for general couriers and specialised online retail returns. For media enquiries, please contact Cait McLaughlin on cait@communicait.me or on 00447931993026. Call us for any information about our local courier, urgent (direct) courier, door to door national parcel delivery and express international transport services at 00353 1 6610000 or email us at info@deadline.ie. We are also the first courier company in Ireland to provide a Zero Emissions courier and transport service.